What is nasmiles Family Points Account? Now nasmiles members will be able to combine their SMILE Points by setting up a Family Points Account. This feature will allow for 8 members to combine their points together. Simply watch the Family Points Balance go faster and get ready to take off to your next trip through our exciting & wide selection of destinations. Every time one of your Family Points Members flies with us, all of the earned SMILE Points will be available in the Family Points Balance and therefore redeem it for your upcoming trip or use it towards any of your Family Points Members future flights with flynas. Family Points Account can consist of 1 Account leader + 8 members. A minimum of two people (Account Leader + 1 member) is needed to start benefiting. To start a Family Points Account you must be at least 21 years of age. 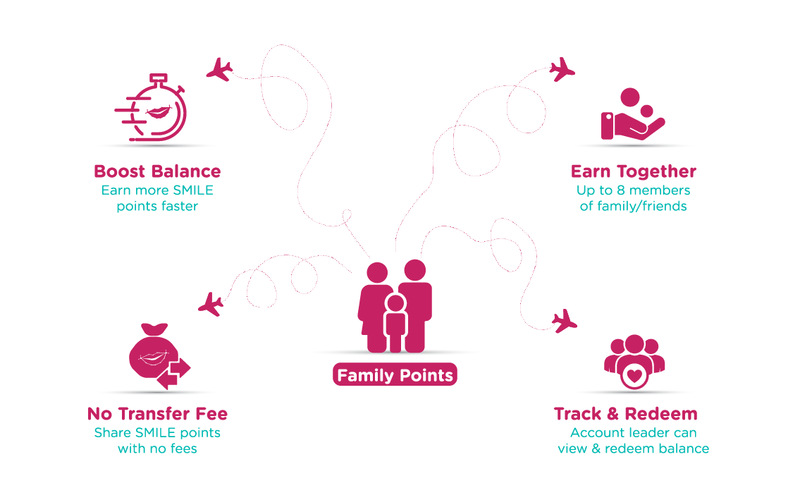 The Account Leader will manage the Family Points Account and use Family Points Balance for future bookings with flynas. Once you accept an invitation to be a member, 100% of your points will be added to the Family Points Balance. Members are not allowed to join multiple Family Points accounts at the same time. A Family Points Member will be able to redeem their own points through their individual account. Click here to view Family Points Account FAQ’s for more information.